On the 22nd of July 2016, a team from the ICD had the pleasure of meeting Amb. Andreas Benjamen Dawid Guibeb, the Ambassador of the Republic of Namibia in Berlin. During the interview we had the opportunity to gain a deeper understanding of German-Namibian relations and the diplomatic work of his Excellency. We discussed the substantial role that cultural diplomacy can play in the field of international relations, as a means towards the promotion of global peace, intercultural understanding and tolerance. Furthermore, we discovered how music and fine arts can contribute to the same, through practical examples that his Excellency shared with us, drawn from his long diplomatic experience. 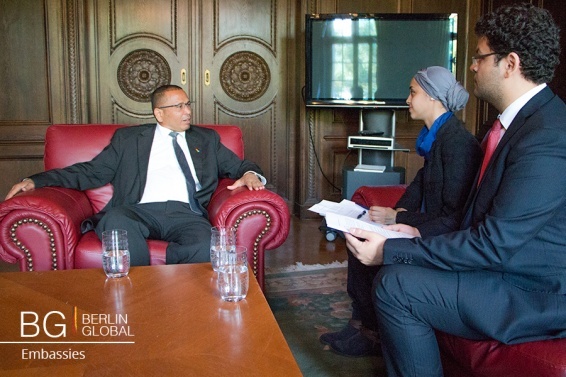 At the beginning of the interview we discussed the Ambassador’s long and successful career and asked his Excellency to discuss the most challenging missions and tasks entrusted to him during his career. His Excellency referred, first and foremost, to the very challenging position in which he served at the beginning of his career, being the 1st Permanent Secretary of the Ministry of Foreign Affairs of Namibia, at the early age of 34 years old. His Excellency recalled the high expectations the Namibian people after the success of the long liberation struggle during the first years of the establishment of the Republic of Namibia. Yet, his Excellency commented additionally on several challenging positions in which he had served, such as that of being the CEO of Air Namibia, and he noted that, in his perception, each position had its own significant challenges which contributed to his personal development and they included tasks that added value to Namibia. Moving on to another topic we asked Amb. Dawid Guibeb to elaborate on the reasons behind his decision to become a diplomat. Amb. Dawid Guibeb commemorated the life and words of the world-renowned entrepreneur Steve Jobs, who, in his commencement address at Stanford University at 2005, stated that “you can’t connect the dots looking forward; you can only connect them looking backward” and he emphasized the essence of remaining open and seizing opportunities. Moreover, his Excellency referred to his student years, during which he had studied in central Europe, in Germany and Switzerland, worked for various prominent Institutions, such as the Center of Applied Studies in International Negotiations, and encountered the President of the Swiss Red Cross. His Excellency also made particular reference to his active participation and involvement in student politics during the liberation struggle, which was the initial step for his subsequent involvement in Namibia’s general administration after its liberation. Asking Amb. 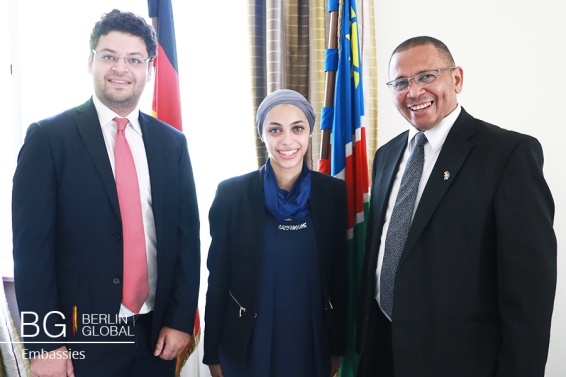 Dawid Guibeb about the diplomatic relations between Germany and Namibia and its evolution over time provided us with a first class opportunity to gain insight into the German-Namibian relations and the diverse Namibian modern society. Amb. Dawid Guibeb referred to the long liberation struggle of Namibia’s people and to the strong moral and historical ties which are binding Germany and Namibia. His Excellency referred extensively to the past of Namibia, as the sole settler [: Siedlung] colony of Germany in Africa, and explained its impact on today’s demographics in Namibia and its diverse society. Namibia currently hosts the largest German community in Africa with a substantial part of the population being Namibians of German origin. After Namibia’s liberation, reconciliation with Germany was achieved and today Germany and Namibia cooperate closely in many sectors, for example German tourists in Namibia are the leading group in the growth of Namibia’s tourist industry. As Amb. Dawid Guibeb characteristically mentioned “Namibia is a good reference for everybody in terms of democracy, in terms of tolerance, in terms of the freedom of the press, in terms of generally a good intent to live together and do together now, with Africans and former colonizers, Europeans. We are 13 tribes, Germans, people of German origin, people of African origin, people of South African origin as well, but living peacefully and harmoniously. Everyone can do their own thing as long as we all advance together”. Discussing with the Ambassador about the concept of Cultural Diplomacy, he shared his thoughts and provided critical practical examples of its use drawn from his long experience. “Cultural Diplomacy is when you put in the foreground an exchange of ideas around things that people naturally love” the Ambassador said. Amb. Dawid Guibeb stressed the critical role that sports, music and fine arts can play in intercultural exchange and understanding, as beloved activities that connect rather than divide people, and recalled his childhood during which he was fortunate to discover the universal power of music. In the same regard, his Excellency, made a special reference to the great contribution of Namibia’s many Cultural Ambassadors, athletes and musicians, distinguished poets and young painters, and to Namibia’s diverse history and society that allows the country to be a credible messenger of the values of peaceful coexistence, tolerance and unity. Special reference was also made to the Olympics and the Olympic spirit and to the Lutheran World Federation activities on the occasion of the 500th Jubilee of the Reformation in 2017, that will take place in Germany and abroad to promote the message of peace and peaceful coexistence. Finally, talking about the recent development of the launch of the e-passport by the African Union Amb. Dawid Guibeb shared his thoughts about the African Continent as an open access area for every African. Amb. Dawid Guibeb commented on the introduction of the e-passport as being “a very important evolution” in alignment with the message of the founding fathers of Africa who had understood that Africa should be united in order to be strong and prosperous. In the same regard, Amb. Dawid Guibeb informed us that Namibia is one of the three countries of Africa that have abolished visa requirements and argued in favour of a complete removal of visa restrictions for all Africans in all African countries as a first step to fulfil the vision of the founding fathers of Africa. According to Müller, private investments should be supported if we are to build upon these initial foundations. Currently 25 German firms work in Rwanda and one of the main aims of the grant is to encourage more German entrepreneurs to invest in the country. "We intend to negotiate a commitment of $84 million in 2017. This will be our support for the next few years to come for very specific projects. I believe that we can multiply the impact many more times if we support the proposal put forward by Minister Gatete to support private investment like attracting German companies to invest in Rwanda," said Mueller during a news conference in Kigali. Müller also acknowledged the efforts of Rwandan government and commitment of citizens to rebuild the damaged economy following a period of conflict. He declared that Germany would support any attempt by Rwanda to further develop the country. "We will continue to support the work of the government with focus on decentralisation and in vocational education and training areas," he said. Germany has been supporting Rwanda for a number of years, especially in the Technology and Education sectors. One third of the $84 million grant will go towards supporting Technical and Vocational Education and Training (TVET). This donation is not the first instance in which Germany has provided support to Rwanda. In May 2015 the Rwandan government received a grant of $17 million (circa Rwf13 billion) to develop the "Hydropower Station Ruzizi III" project. Funds have also been invested in new training equipment and renovating or extending existing facilities at technical schools. The total cost of the project is estimated at around $650 million. Germany is currently the only partner country supporting the project.